We are Lockwood And Greenwood Ltd, we are a leading used car dealership in Audenshaw, Manchester. And our Service and MOT Repairs at Ryecroft Street Ashton Under Lyne OL7 0BU We are a family firm established back in 1931 and recently celebrated over 84 years in the Automotive Industry. To many of our customers we are a complete motoring solution offering vehicle sales, servicing and MOT inspections not to mention our in house parts department. Book your car service, repair or MOT at Lockwood & Greenwood Ltd.
It’s easier than you think to book your car in at Lockwood & Greenwood Ltd online. All it takes is a few clicks right here at bookmygarage.com. Why not book the service or repairs you need today? 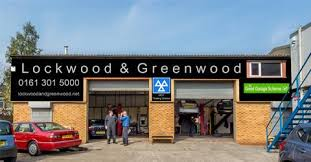 The Greater Manchester area boasts a number of fantastic garages and Lockwood & Greenwood Ltd in Ashton Under Lyne is a great example. An independent garage with years of experience, Lockwood & Greenwood Ltd can’t be beat for car repairs, services and MOT’s at reasonable prices. Whatever the make or model of your car, their experienced mechanics can get the parts you need and get the job done. You could drive to Lockwood & Greenwood Ltd in Ashton Under Lyne and make a booking but that takes effort, time and petrol money. With bookmygarage.com, you can book a Greater Manchester garage in seconds, from the comfort of your own home or anywhere else besides. It’s the quickest and easiest way to find a garage for car services, repairs or MOTs and get the job done. bookmygarage.com allows you to make an informed decision, before you part with your hard earned cash. You can check out opening times and directions to Lockwood & Greenwood Ltd from wherever you are. You can also read honest, independent feedback from the garage’s previous customers. Like what you see? Your booking is just a few clicks away. Give us your car registration then choose service/MOT or car repairs. You can book right here at bookmygarage.com and you don’t pay us a penny. You only pay when the work is done. It really is as simple as that. Go from 0 to ‘good-as-new’ in seconds with Lockwood & Greenwood Ltd and bookmygarage.com.